The sister ship of the stranded Riverdance ferry is being inspected by workers to help formulate plans to dismantle the beached vessel. The firm tasked with dismantling the ferry, which is grounded on a Blackpool beach, took over the site on Monday. The 2,600 tonne Riverdance is due to be stripped down before being cut into pieces and transported for recycling in an operation expected to take 14 weeks. Experts boarded sister ship the Moondance in Heysham on Monday. 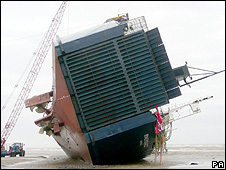 The Riverdance ran aground off the Lancashire coast in January after being hit by a freak wave as it sailed from Northern Ireland to Heysham. Hancock's Contractors in Heysham, Lancashire, has been awarded the contract to dismantle the Riverdance, which has now sunk about 4m (4.4yd) into the sand. Dave Etheridge, contracts manager with PGC Demolition, which is supplying machinery to Hancock's, said it would be a complex salvage operation. He said: "We've been on board the sister ship to give us a feel for how the Riverdance is constructed. "The sister ship is identically built and was refurbished at the same time, so we are doing a recce to see what we might come across, apart from the cargo." Mr Etheridge said the first step would be to cut a large hole into the side of the Riverdance, to remove the cargo from inside. He said: "There are about 26 trailers still on the boat - mostly holding planks of wood, insulation and scrap metal. We don't want it floating away. "We want to be left with a clean, empty shell before we start cutting the ship up." The operation will be hampered by tide times, which will mean workers must carry out some of the process at night. Mr Etheridge said: "When the tide is in, we can't do any work on the ship because it's dangerous. "We fully understand residents' concerns regarding night working, but it's a choice of two evils - the residents want it done as soon as possible, but unfortunately we can't knock nails in with rubber hammers."